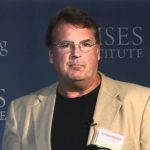 Thomas DiLorenzo: USSA? Socialism is Pervasive in the US? - Wall St. for Main St.Wall St. for Main St.
Thomas DiLorenzo: USSA? Socialism is Pervasive in the US? Jason Burack of Wall St for Main St interviewed first time guest, author, Austrian School Economist https://mises.org/profile/thomas-j-di… and professor of economics at Loyola University Maryland, Thomas DiLorenzo about his new book, The Problem with Socialism. During this 30+ minute interview, Jason starts off by asking Tom his definition of socialism. Tom talks about how FA Hayek and Mises adapted their definitions of socialism from the textbook definition of owning the means of production to redistribution of wealth and a progressively higher income tax. Jason, then asks Tom, in his opinion, how pervasive is socialism in the US?Thomas says it’s widespread. Jason asks Thomas if central banking is socialist? Thomas says is it was in the communist manifesto. Jason and Thomas discuss Democratic socialist countries like: Germany, Canada and Scandinavian countries and how well they are doing economically. Jason also asks Thomas if millennials are brainwashed to believe in socialism and about Venezuela, whether Keynes was a socialist and also the Marx labor theory of value.